BRANDON, MB — Daryle McCannell of the Department of Physical Education was recently awarded the Innovator Award by the Manitoba Physical Educations Teacher’s Association (MPETA). This award is presented to a member of MPETA who has made a significant contribution to physical education by devising an innovative approach to instruction, by writing new curriculum material, by creating new devices or aids that improve the educational experience of students. 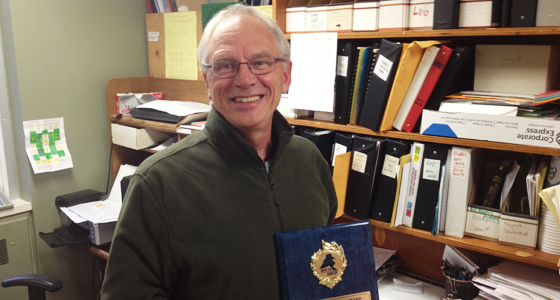 Over the past 25 years, Daryle has promoted active lifestyles and healthy communities in the Westman area. His belief that laughter and humour are good for the body and soul has put him in demand as a speaker, motivator, and presenter at community, provincial and national health initiatives. Perhaps nowhere is this belief more prevalent than in his classroom. During the 25 years Daryle has been with Brandon University he has held various positions including Athletic Director and Recreation Director. Daryle is currently Chair and Assistant Professor in the Department of Physical Education. His early experience included five years as a public school physical education teacher followed by five years as Program Director of Brandon YMCA.